To record expiration of prepaid insurance. To record revenue earned but not yet billed (nor recorded). To record wages expense incurred but not yet paid (nor recorded). To record annual depreciation expense. To record revenue earned that was previously received as cash in advance. 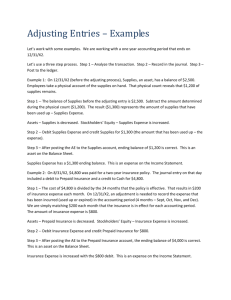 journal entry to reflect expiration of the insurance as of December 31 , 2013.
and the Supplies Expense account as of December 31 , 2013.
account for the work performed from October 1 through December 3 1, 2013? the Subsc ription Revenue account and the Unearned Subscription !Revenue account. · · · · .................... .
Culpepper make on July 31 to correctly record accrued salaries expense for July? 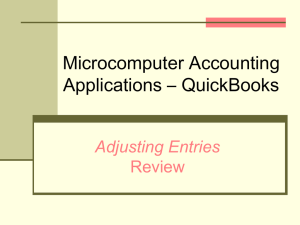 Adjusting entries affect at least one balance sheet account and at least one income statement account. company records all prepayments using balance sheet accounts. a. Entry to record revenue earned that was previously received as cash in advance. b. Entry to record wage expenses incurred but not yet paid (nor recorded). c. Entry to record revenue earned but not y et billed (nor recorded). d . Entry to record expiration of prepaid insurance. e. Entry to record annual depreciation expense. these customers. The company incurred expenses of $25,500 but had not paid $5,250 of them at yearend. The company also prepaid $6,750 cash for expenses that would be incurred the next year. 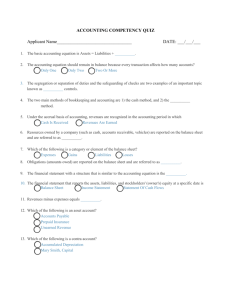 Calculate the first year's net income under both the cash basis and the accrual basis of accounting. The following information is taken from Brooke Company's unadjusted and adjusted trial balances. Given this information , which of the following i s likely included among ils adjusting entries? A $400 credit to prepaid insurance and an SBOO debit to interest payable. A S400 debi1 to insurance expense and an S800 debit to interest payable. • A $400 debit to insurance expense and an $800 debit to interest expense. Understate net income by $2,000. ® Understate expenses by $5,200. be debited and the account to be credited. 2. Adjust the Unearned Services Revenue account to recognize earned revenue. 3. Record services revenue earned for w hich cash will be received the following period . Deklin Company reported net income of $48,152 and net sales of $425,000 for the current year. average profit margin of 15%. the end of its first accounting period? Consulting Fees and a credit to Consulting Fees Earned. debit to Consulting Fees Earned and a credit to Unearned Consulting F ees. 0 Unpaid salaries are recorded with a debit to Prepaid Salaries and a credit to Salaries Expense. 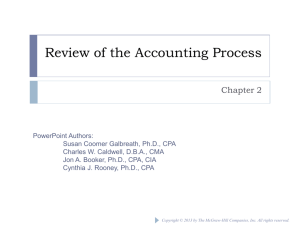 Answer each of the following questions related to international accounting standards. nearest to maturity or v ice-versa? One-third of the work related to $15,000 cash received in advance is performed this period . Wages of $1 1,000 are earned by workers but not paid as of December 31, 2013. Depreciation on the company's equipment for 2013 is $11 ,200.
insurance policies shows that $2,000 of unexpired insurance benefits remain at December 31, 201 3.
ended December 31 , 201 3. The interest revenue will be received on January 10, 2014.
year ended December 31, 2013. The company must pay the interes t on January 2, 2014.
a. 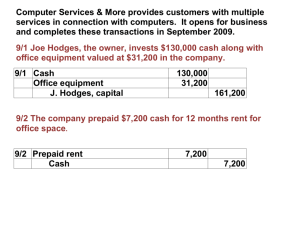 Depreciation on the company's equipment for 20 13 is computed to be $ 17,000. $ 1,090 of unexpired insurance coverage remains. d , Three-fourths of the work related to $13,000 of cash received in advance was performed this period. 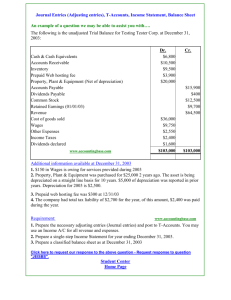 f. Wage expenses of $6,000 have been incurred but are not paid as of December 31, 2013.
assum e that fees collec ted in advance of work are initially recorded as liabilities. legal services was made by the company on May 12. April 30, $2,037 of interest expense has accrued. the employees had worked two days since the last payday. The ne.xt payday is May 3. Determine the missing amounts in each of these four separate situations a through d.
beginning on that date. Refer to that policy and fill in the blanks in the following table . Which of the frve companies 1s the most profitable according to the profit margin ratio? information concerns the adjusting entries to be recorded as of that date. supplies available at December 31 , 2013, totaled S2,554 . b. An analysis of the company's insurance policies provided the following facts. December 31 , 20 13, is a Tuesday, and all 15 employees worked the first two days of that week. $45,000 salvage value at the end of its predicted 30-year life. Annual depreciation is $30,500. 1. Use the information to prepare adjusting entries as of December 31 , 20 13. Adjusting entries (all dated December 31. 2013). 2. Prepare journal entries to record the first subsequent cash transaction in 2014 for parts c and e.
this period's earning of prior unearned revenue. payment of an ace rued expense. receipt of an acc rued revenue. this period's use of a prepaid expense. payment of a prepaid expense. December 31 , 2013, follow. a. An analysis of WTl's insurance policies shows that $2,400 of coverage has expired. b . An inventory count shows that teaching supplies costing $2,800 are available at year-end 20 13.
c. Annual depreciation on the equipment is $ 13,200.
d. Annual depreciation on the professional library is S7,200. contrac t calls for a monthly fee of $2,500, and the client paid the first five months' fees in advance. month will be recorded when it is collected in 2014.
the rate of $100 per day for each employee. are made only at year-end. Adjusting entries (all dated Dec. 3 1, 2013). 2.1 Post the balance from the unadjusted trial balance and the adj usting entries in to the T-accounts. a fo.,,...u !a · bas~ cak u ation is ir,correct : nc. 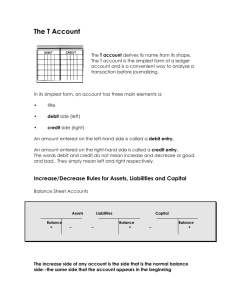 2.2 Prepare an adjusted trial balance. 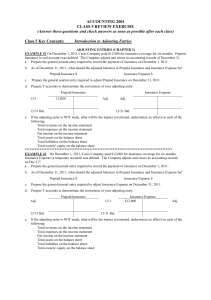 3.1 Prepare Wells Technical lnstitute's income statement for the year 20 13. 3.2 Prepare Wells Technical lnstitute's statement of owner's equity for the year 2013. 3.3 Prepare Wells Technical lnstitute's balance sheet as of December 3 1, 20 13.
because New Year's Day was an unpaid holiday. a. Prepare the adjusting entry that would be recorded on Monday. December 31 , 2013.